With 90 works on display, the retrospective The Hand of the Master gives ample evidence of that, presenting almost half of Breugel’s surviving paintings, drawings, and engravings. It marks the only time that such an abundance has been gathered in one place, as many of these fragile works are rarely loaned out. In terms of scope and ambition, this remarkable exhibition is equalled only by the 2016 Hieronymous Bosch retrospective in Noordbrabants Museum and the Prado. Born around 1525 in the Netherlands, Breugel lived a relatively short life yet produced a hugely influential body of work in the span of not quite two decades. Known by a multitude of guises – peasant painter, moralist, satirist, humanist – his themes ranged from the bucolic to the apocalyptic, the droll to the dramatic, all created with a meticulous attention to detail. The exhibition opens with a room of his drawings, many of them made during the travels of his youth (1552–1554); masterfully composed woodland scenes and landscapes in sepia ink display Breugel’s already impeccable draftsmanship. These were to become the foundations for the unending vistas he would later weave into his large format paintings, most notably in the Seasons series. Four of the surviving five are on display, depicting the year’s cycles along with the people inhabiting them: cowherds, drunken revelers, hunters, harvesters – in short, people going about their lives against the backdrop of the world. Taking its cue from the exhibit’s title, the side rooms bring the creative process and materiality of the paintings to the forefront in very accessible and compelling ways. The enigmatic Two Monkeys is displayed alongside a detailed reconstruction of the different stages of its creation. In the next room, plaster casts of hands demonstrate the exact usage of different implements – sponges, various brushes, sticks, the painter's fingers – accompanied by magnifications that show the variety and ingenuity of the tools in use. In yet another room, the restoration process for 'The Suicide of Saul' is painstakingly documented, detailing the almost Sisyphean effort required to keeps the inevitable ravages of time at bay; as if to underscore this point, even the cotton swabs used to remove the varnish on the paintings have been gathered up and displayed in their hundreds. Another vital companion to the exhibit can be found online at insidebruegel.net, a website displaying the Kunsthistorisches Museum’s 12 Breugels photographed in staggering detail, allowing you to inspect each from a distance of mere millimetres, where, incredibly enough, further minuscule scenarios continue to play themselves out. This depth of detail is best observed further along in some of Breugel’s best known paintings like Christ carrying the Cross – arguably one of the crown jewels of the KHM’s collection. The titular event seems almost incidental, so overwhelming is the wealth of additional meaning and visual information. Towards the end of the exhibit, the viewer is confronted by the haunting vision of The Triumph of Death: Personified by a surfeit of skeletons, entropy is on the march, unyielding and all-consuming, ending all human endeavour. Ships flounder, towers burn. Life falters and flees before the onslaught, but there’s nowhere to turn. The bleakness and despair is palpable – and mesmerising. 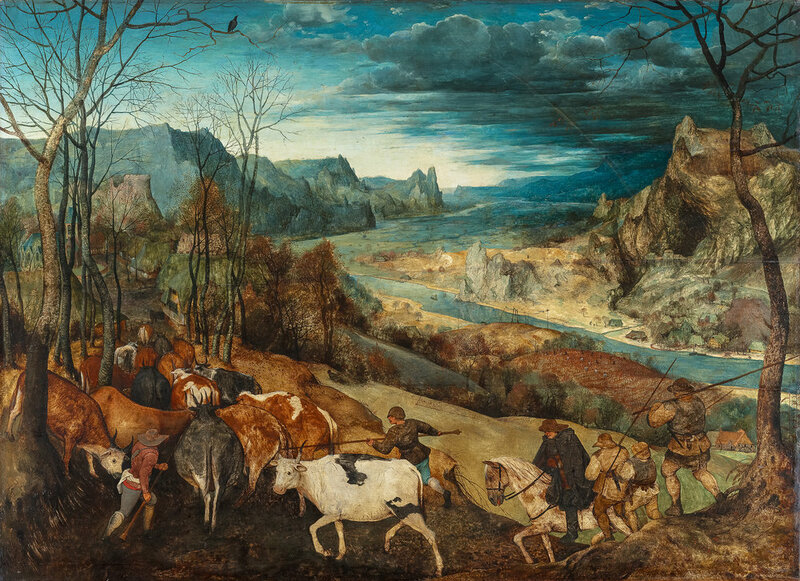 Breugel’s power remains undimmed by the passing centuries, his ability to fascinate reverberating all the way to us. He used his immense capacity for observation and understanding to depict people as they are and not as they should be, with all their failings and joys. Portrayed with a vividness and detail that boggles the mind, the worlds Breugel created ensure that you always feel there’s unendingly more than meets the eye.